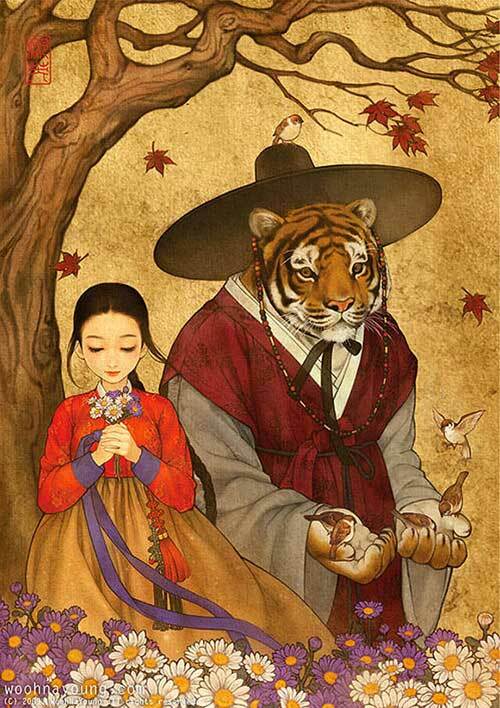 The characters are drawn in Hanbok, a traditional Korean dress. Hanbok usually have simple but bright colors that are divided by simple lines. It is worn in modern days as semi-formal or formal wear, similar to kimono in Japan. In Korea, there is an annual Hanbok Day on which both men and women are encouraged to exercise their cultural roots and don the traditional outfit. In Wooh’s artwork, the hanbok are elegant and flowing. They give the reader a feeling of traditional Korean flare in the context of a larger-than-life world. Some other masterful examples of hanbok are shown in another one of Wooh’s collections, “Women in Hanbok.” If you love this gallery, be sure to check out her other work! In “Fairytales,” (<– see that link for HD) Wooh creates her own interpretations of Snow White, The Little Mermaid, The Frog Prince, Little Red Riding Hood, Beauty and the Beast, The Wild Swans, The Snow Queen, and Alice’s Adventures in Wonderland. We’re particularly fond of the re-imagining of the Beast from Beauty and the Beast as a tiger on two legs. The main character throughout all of the different pictures seems to be the same — perhaps it’s Wooh imagining herself in these make-believe worlds?